These fun & unique dangling earrings feature a turquoise stone set on a sterling silver plate with southwestern stamping around the perimeter of the stone. 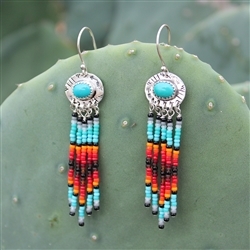 They are set off with multicolored beads dangling from the bottom. These are a showstopper!